Aurora Sea Wolf series is the most solid and durable wristwatch in all Reef Tiger watches. To further expand Aurora Sea Wolf series of sport watches, Reef Tiger has made a kind of wristwatch with stunning complicated workmanship. It is to fully interpret the function of column-wheel flyback chronograph and deep diving for traditional sport watches. The launch of Aurora Seawolf watches is inspired by the imagination of deep sea. It shows the ecology and reproduction of life in the deep sea with luminous, ocean waves and mechanical texture, combined with the material of the Seawolf submarine, to create an attack value watch. Sea Wolf Watch contour with 44.5mm is quite round and beautiful. Jugged crown, good quality case with strong curved lug, close to the wrist, makes quite comfortable and highlight personality. Sapphire crystal with 9.1mm thickness is anti-corrosion, scratch proof and durable, which makes visual arts as clear as the new. 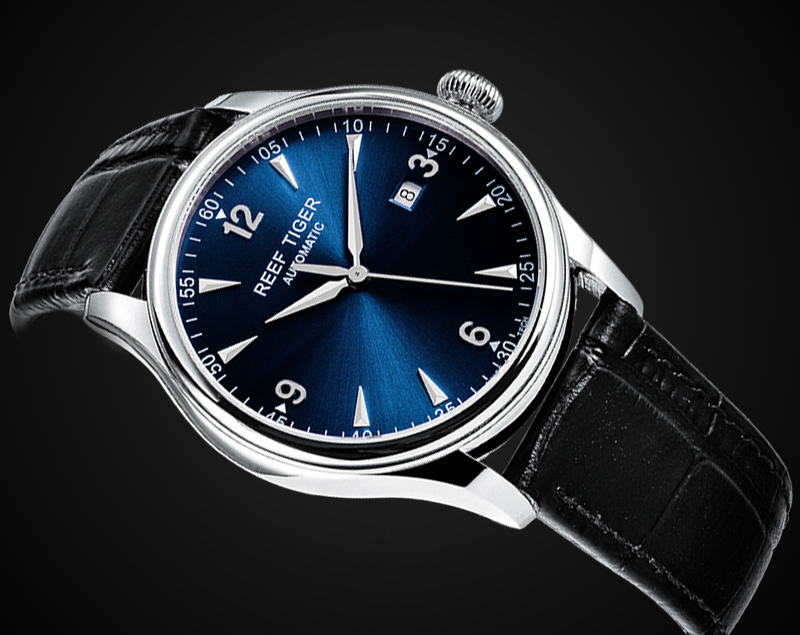 The amplification effect of strong luminous on the small space of the dial shows hazy and blurred. It seems to be out of a mirror by visual dynamic. The dial of Seawolf series made by designer looks like the black hole seabed. Shimmer texture shading matches up with lighting effects very well. Between black and shimmer, it shows the infinite vitality in the black ocean, which perfectly matches with the name of Seawolf. Special lines of nylon cloth with leather strap will become rich texture over time, adds some classical color to Seawolf watch with era sensation. Italian imported calfskin with the same color cotton thread by hand sewing. The feeling of wearing is quite soft and breathable. As is well-known, movement is the heart of a watch. The stability of the Reef Tiger RT7902 Automatic movement directly related to the life of the watch. Reef Tiger remold the excellent movement following the watch factory. 24 Jewels, 21600BPH is to ensure the day error rate not exceed 10 seconds. It is the core of Reef Tiger Swiss horological technology.